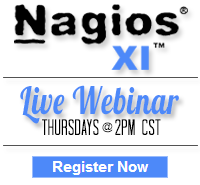 Nagios is pleased to announce the release of Nagios XI 5.3.0. This release includes improvements to the back-end memory usage, improved stability of Nagios XI, and overall better performance improvements. Nagios XI 5.3.0 provides easy to use interfaces with scheduled downtime, performance graphs, and graph pop outs on status pages and new components for managing user macros and custom included files. API endpoints and custom API extensions are a new addition as well, making it easier for users to make mass changes. There are multiple changes to the Core Configuration Manager (CCM) including CCM in-application plugin testing. In addition, the release has increased security features, new security settings, and new improved help sections.